Have you ever suffered from chair-anoia? Chair-anoia is the fear of skiing under chairlifts because you think that people are watching you ski – no, make that judging your skiing! If you have ever experienced that fear, you were right: they were watching and judging your skiing ability. I believe chair-anoia is less prevalent today than in the RetroSki days. I don’t know if we have become a kinder, gentler skiing community or whether high speed lifts have somehow changed the dynamic. When I’m skiing Liftline under the FourRunner quad today, I don’t sense the same peer pressure I felt when it was the old single and double chairs. 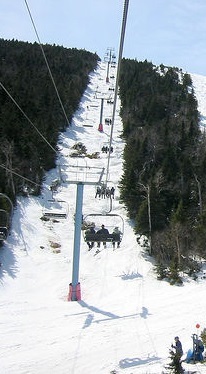 Liftline in the single chair days was a real test. There was no snowmaking or grooming so the upper pitch today gives you a flavor for what the whole trail was like. And over your head were some of the best skiers in the east watching your every turn. Certainly some of them were rooting for you to succeed, but there was that feeling that some were just waiting for you to screw up. If you did take a fall – particularly a spectacular fall – those suspicions were confirmed by the audible reaction from the chairs. 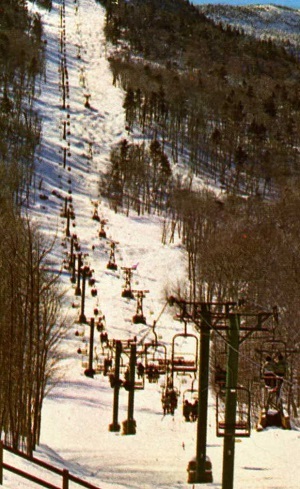 One of the few places that I suffered from chair-anoia was the old Stowe Liftline. 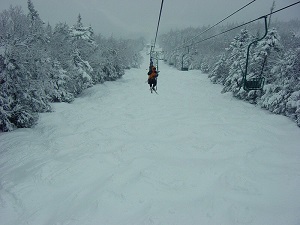 One of my favorite trails under a lift is Mall at Sugarbush which is under the Valley chair. Mall doesn’t get the credit or traffic that its nearby neighbor Stein’s Run gets. That could be because it doesn’t have snowmaking and is narrower, but it could partly be because of chair-anoia. I always liked the moguls better on Mall than Stein’s. And when you had a good run, the audience overhead was a bonus! Another of my favorites is the Chute at Mad River Glen. In keeping with Mad River’s RetroSki atmosphere, the upper Chute is a good old fashioned mogul run. It’s been quite a few years since I’ve skied it, but I’m betting those bumps are still tight. It was particularly fun in the Spring when you could take laps from the mid-station on the single chair. Since all Mad River skiers seem to prefer the woods, it’s hard to tell if chair-anoia is a factor for the reduced traffic on the Chute. 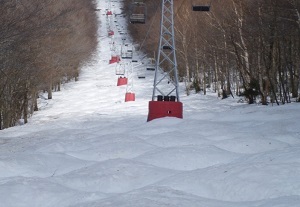 While we’re in the Mad River Valley, the Black Diamond trail at Sugarbush’s Mount Ellen is a short, narrow, steep pitch under the summit chair. Back when that area was called Glen Ellen the trail had a different name. Walt Elliot who founded and named Glen Ellen continued the Scottish theme naming the trail Scotch Mist. It surprised me that there were no correct responses to last week’s trivia question. Apparently chair-anoia meant not too many people ever skied that trail. Whenever I think of chair-anoia, I think of the Limelight run at Sun Valley. Those who have visited Sun Valley lately will say “Wait a minute, Limelight isn’t under a lift.” Oh, but it used to be. And unlike the Chute the bumps on Limelight were big! I was having an epic run down Limelight in eighteen inches of heavy powder and had forgotten completely that I was under a chair. In my euphoric state I launched a jump off a catwalk. When I landed, my skis sank into the powder and I pitched forward to plant my face in eighteen inches of heavy powder. I can still hear the roar from up-and-down the chair over my head. By the way, in the late 1970s and early 80s, you didn’t want to be skiing on Limelight at about 2:30 in the afternoon, but you might have wanted to be riding up that chairlift. In those days Sun Valley was home to some of the best freestyle mogul skiers in the world and at about that time of day there was an informal gathering on Limelight which of course became an informal contest. It was an amazing show. Big Spruce Double Chair (Main Street), although no one was watching. They were wrapped in blankets and parkas (management: raccoon coats!) ’cause it was so cold and windy. They didn’t uncover their heads until they got a wake-up notice from the “multiples” (Tower #23? ).